Delegation of Altai State University participated in Moscow International Education Fair, which was held on April 18–21, 2018. The program of the largest event in the field of education in Russia this year was called "The New Education Ecosystem" and was aimed at developing communication among all participants of the educational process in Russia and abroad. Altai State University was represented by Vice-Rector for International Affairs Development Roman I. Raikin and Head of the Department for Prospective Students Recruitment Elena N. Goncharova. 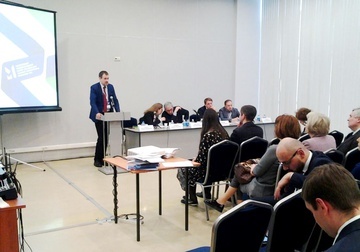 They participated in two round tables of the forum dedicated to the issues of working with talented youth: "Creation and Development of the Regional Centers for Identification and Support of Gifted Children" and "Development of the Natural-Science and Technology Directions of Additional Education for Children". "Being one of the major segments of the system for working with gifted children in Altai Krai, Altai State University presented its experience in working with talented youth at the Education Fair. We participate in most regional projects in this field," Elena Goncharova emphasized. “The main result of our participation was the exchange of useful information on working with gifted pupils and students, as well as establishing contacts with colleagues from other regions. For example, various models of work in this direction were presented at the fair: models involving additional education organizations, distributed models, etc. The colleagues’ experience showed that we have chosen the strategically correct direction, which is based on network educational programs, development of the competition system, mobilization of the potential and resource base of our partners from among employers. For the present moment, this is one of the main strategic lines, which is being worked out at the level of the Ministry, in the regions, and at our university." The delegation of ASU also took part in the events of the Education Fair devoted to the promotion of educational programs in the international market of educational services. In particular, Roman I. Raikin, Vice-Rector for International Affairs Development, delivered his speech at the round table entitled "The Contribution of Education Exports to the Competitiveness of the Country". Moscow International Education Fair is an open forum and the largest exhibition of new educational technologies, infrastructure and intellectual solutions in Russia. The fair is a platform for the development of a dialogue between the educational and expert communities, state institutions and businesses on current issues of the present and future education system, a platform for attracting the attention of Russian and foreign businesses to participation in the Russian educational process.